I turned 26 (GASP) this weekend. 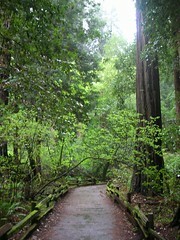 To celebrate teejaymas, Mom and I went to Muir Woods. Also on the agenda this weekend: Muir Beach Overlook, The 25th Annual Putnam County Spelling Bee, Beach Chalet and Lap-POP. After a four-day weekend, I'm back at my desk tomorrow. LE HUGEST SIGH EVAR (as the kids say).